After Bastogne, the Deuce traveled to the 7th Army area in Alsace with the rest of the 101st Airborne in mid-January where they held a line along the Moder River for over a month. In February, the men of the Deuce climbed aboard rail cars to refit in Mourmelon le Petit, France. On March 15, 1945 General Eisenhower visited Mourmelon to present the 101st Division a Presidential Distinguished Unit Citation. This was the first Citation ever presented to an entire division and was in honor of the 101st defense of Bastogne and gallantry in action. The men of the 502nd saw action again in April 1945 when they took up position in vicinity of Dusseldorf, to help close the Ruhr Pocket along the Rhine River. 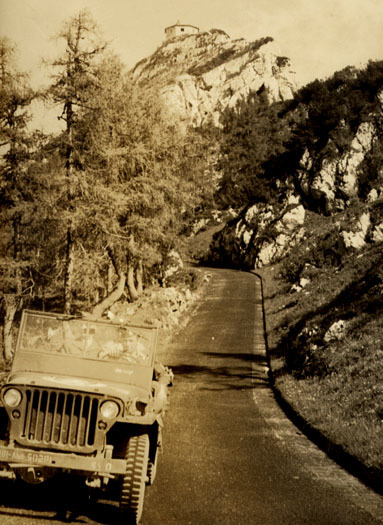 In May, the paratroopers arrived at Berchtesgaden, Germany for a short time. The 502nd spent most of the summer of 1945 occupying Mittersill, Austria. Members of the Deuce with high points sailed home in the summer of 1945, while others, awaiting discharge were absorbed into the Deuce in the interim. Returning to the Joigny-Auxerre area of France the Deuce made a final “pay jump” in September 1945. The regiment and the division were deactivated in December 1945. The unit would be resurrected with the 101st Airborne in 1956. Above left: General Taylor inspects the troops in Alsace. Above Right: Ike 101st Unit Citation at Mourmelon.